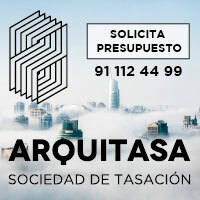 The building occupies a place that – as so many people in the city – was waiting that the trascurso of the time was returning to give him an opportunity. The soil was departing from a singular situation in his immediate environment, to treat itself about a space sealed off in the historical center by his difficulty of urban development management. In fact, the final authorized volume is minor that the predominant one in the superapple in which it is inserted, with some buildings constructed in the years ‘ 70 and ‘ 80 – before of the approval of the PEPRI – that they it overcome in two plants. 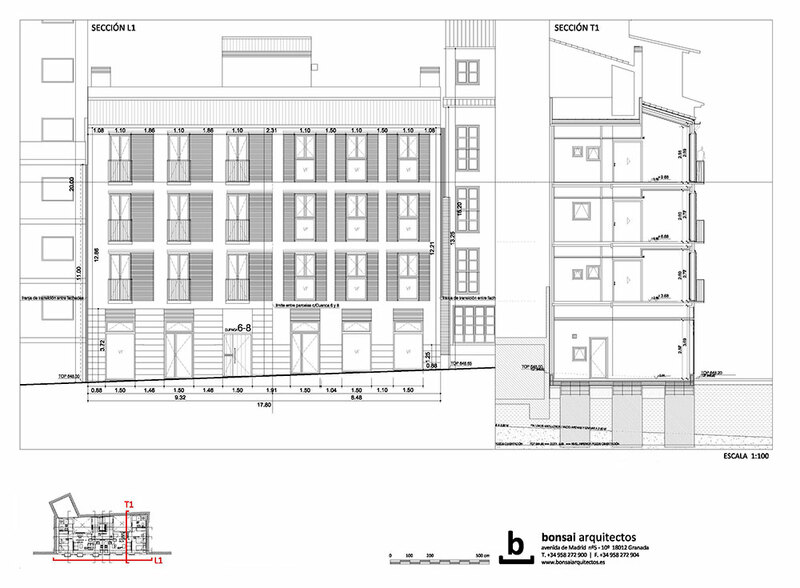 The building is fitted therefore in a context regulated already from the Protection plan of the Historical Center, which imposes a few rigid cánones compositivos. The initial lot is a fruit of an aggregation parcelaria, with the condition imposed from the Delegation of Culture to reflect in gathering the existence of two different plots. With a few dimensions of 17’80 of width for an average bottom of 7’30 m, it was strongly determined by the different nature of three party walls, with different levels of consolidation and collapses. The initial gesture of the project gathers the intention of the Promoter of completing a program of two apartments for plant. The portal remains centered, allowing the distribution of traffics and facilities for the axis of the building – that acts as a real dorsal thorn – minimizing his tour and isolating the noises of the elevator. Two wells of light illuminate and ventilate simultaneously stairs, baths and lounges, and act as thermal chimneys that they contribute to the best crossed ventilation of apartments and stairs. This scheme – director is very simple, but simultaneously very effectively. The front, with 32 º of orientation southwest, does virtue of the inflexibility compositiva imposed from the Protection plan of the Historical Center, arranging a plot of vertical hollows, echoing both initial plots by means of the chromatism and the different design of the hollows. To take advantage of the advantage of the predominant south orientation, the offer does emphasis in the energy efficiency: south gathering protected by means of Majorcans deslizantes, courts to regulate the crossed ventilation, adoption of a system of thermal exterior isolation SATE to produce the surrounding constant one without thermal bridges, tabiquería and floating soil like box inside box that guarantees the protection to fire of the structure of wood. The cover is solved by normative imposition by a solution of traditional tile, leaving a later zone of flat terrace for facilities – the Plan Center does not allow the location of solar plates. The dividing neighbors have treated each other using motives of sky, to minimize the visual impact of the big cloths of cement, in a modest honoring to the Sevillian painter Carmen Laffón and his installation “Grapevine in autumn” for San Telmo’s remodeling palace – headquarters of the Andalusian Parliament. In interiorismo have bet for the utilization of the color to differentiate the plants and to favor the orientation of the users, unifying the chromatic range of walls and tiled in interiors and common zones. The board of wood of pressed fibers OSB is constituted in leit motiv of the whole design as coating of singular walls, to evoke the paper that the wood plays in the structure of the building. During the study of costs and period we come to the conclusion of that the hypothesis of a special structure of wood was feasible for the case that was occupying us: a building between dividing in historical hull, of four plants of appeal in a street of 3’5 meters of width without possibility of space for collections, for a promoter who rents apartments and places. In this case the saving period was turning out to be critical to put in value the investment; in the process of bidding they handled period of between 12 and 18 months for conventional systems, opposite to the 7 in which finally the work was awarded. Also it was critical the ratio fitted useful constructed surface, because of the wastages of the size of plot after carrying out the demolition of ruined building that was occupying most of the lot. 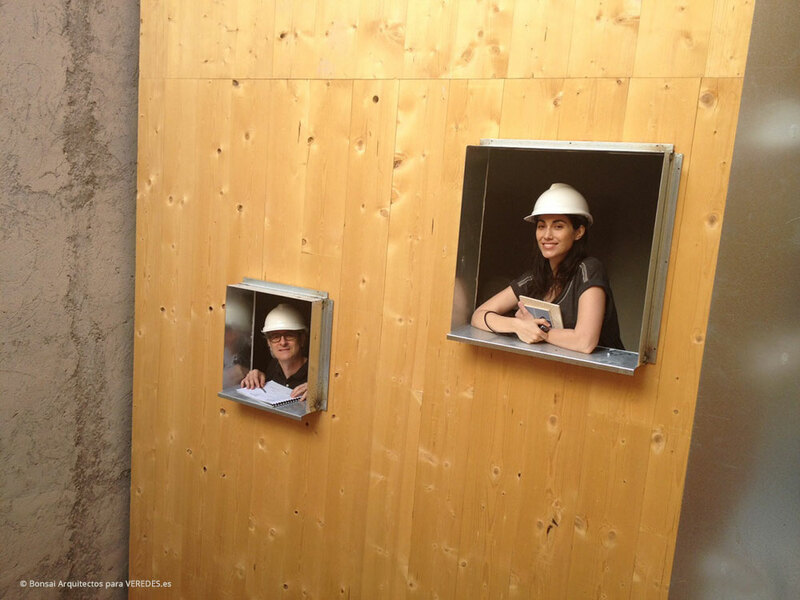 To validate the total investment the cost increase was analyzed with regard to a work – type by difficulty of accesses, employment of high places levels of isolation, system use of ‘work dries’, and special structure of wood to improve period. The conclusion is that the repercussion of the major cost for structure is relatively small in the total volume of the investment, turning out to be more determining other factors. Though in the previous months we had studied meticulously the advantages and disadvantages of constructing with wood -and even we were experienced previous at rehabilitations with structures of wood- as we were developing the project there was taking place the confirmation of the environmental advantages and of high ecological added value, which for the Promoter constitute a stamp of differentiation in an environment of high competitiveness for the rent of apartments. Given the small dimensions of the plot, and the narrow of the street, from the beginning one gave up raising a basement of parking, not at least with solution of montacoches. It was turning out to be much more critical to give an ideal solution to the situation of stairs and courts – bound by the Ordinance to come up to ground floor. Considering the levels in plot after the archaeological excavation, and the conclusions of the geotechnical study, we study a very simple solution by means of wells retranqueados of the dividing ones, up to an approximate level of-3 ‘ 55 meters, to produce a sufficient empotramiento in the level of gravels and sands under the clayey slimes. On the coronation of wells, crossbeam banqueada of 25 cm of thickness, and already it is. 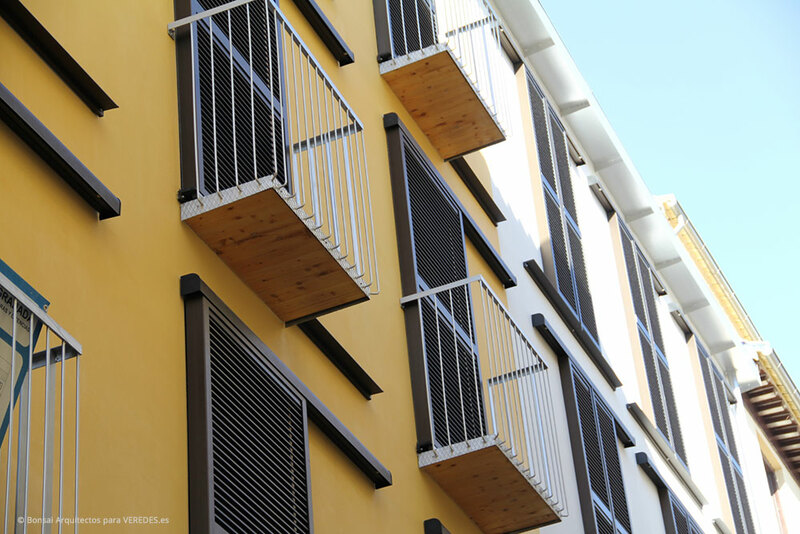 For the rest, our building is constructed as an exempt ‘furniture’ separated from the dividing ones by means of air chambers of variable thickness, ventilated for a better maintenance of the wood. It rests on a system of muretes from foundation, to guarantee a better protection of the plates – walls in his take-off. The singular concept of the surrounding one is completed by the adoption of a structure of counter laminated panels, which solves simultaneously the skeleton and the shell of our building, since for the structural lights they are not necessary intermediate panels. The position of stairs and courts determines an immediate solution of you were squeaking of modest lights, arriostradas for core of communications. The initial predimensionado was respected practically during the project development, optimizing sections of forged in zone of baths and kitchens. This system has supposed a reduction of more than 50 % in a period of a work of these characteristics between dividing and in the Historical Center. Additional, it has allowed to construct minimizing thermal and acoustic bridges, saving energy for utilization of wood – that is an excellent insulating thermal native. The principal logistic challenge rested on the need to organize adequately the fracture of load of the tráiler, gathering the material in periphery for his movement and assembly in work by means of trucks – derricks of half a tonnage. 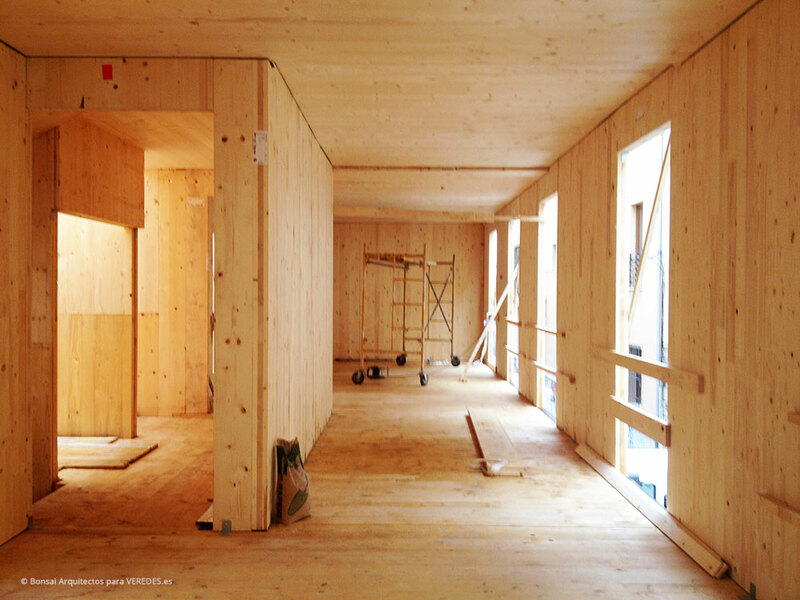 The project of break-down and assembly of CLT’s panels turned out to be fundamental for the success of the phase of structure, which was completed in six weeks. The wood needs very little energy for his production and processing. The ecological fingerprint of the material in relation with other constructive systems is minimal, whereas the capacity of absorption and fixation of CO2 is enormous. For reasons of use and budget, the wood is completely re-dressed to fire in different configurations of plates of carton – plaster. The panels CLT with some level of exhibition – fundamentally in dividing – take treatment biocida to improve his long-term behavior. 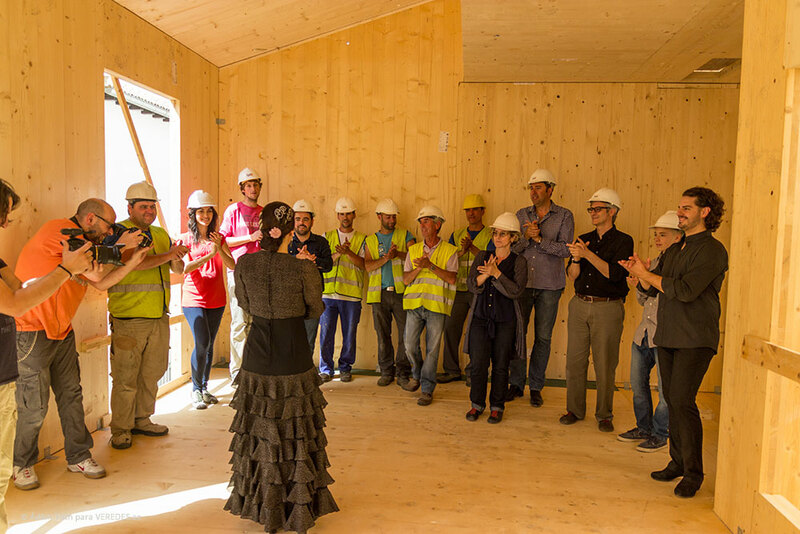 To the completion of the structure there was carried out an event that we baptize as “Sustainable Fleming”, in collaboration with the ‘Carmen de las Cuevas’ dance school. Between great expectation a pair of dancers they tapped on the tablao of our wrought ones, making possible for one day the union between dance and wood. Energy efficiency and acoustic behavior. In the project phase there was carried out a detailed study of acoustic transmission, verifying the behavior of the building on a theoretical model of calculation who was checked for several different options, considering all the materials of the surrounding one. It was chosen for a solution based on a combination of panels of carton-plaster in partitions and underlying of walls and ceilings, with dry crossbeams, all this on sheet of polyethylene expanded of closed cell of 5 mm, and ended with floating laminated pavement. The structure of wood allows a suitable disposition of the isolation for his exterior face, minimizing the thermal bridges. It was chosen for a system SATE integrated by panels of polystyrene extruded of 100 mm taken with mechanical fixings and adhesive, re-dressed by his exterior face with coating based on mortar, mineral loads, resin and mesh of glass fiber, with ended acrylic pigmented in mass. Special transcendency has the utilization in fronts of windows of high range of aluminium with rpt, in combination with Majorcans deslizantes of the same material – fundamental for the ideal control of the solar incident on the glasses depending on the station. The good use of the above mentioned Majorcans allows to shield loads in summer, and to allow solar earnings in winter with great facility. Double glazing with low glass emmision chamber of dehydrated air, and double laminated acoustic glass and of safety, which helps to favor the attenuation of the sound. Other improvements in the energy efficiency: lighting LED in exclusive and common zones; air conditioning by means of units aerotérmicas independent from last generation. · The work has been fenced constant protecting the viandante at all time. · There have been respected the signpostings of warning, prohibition, obligation, and of rescue and help and it has invested time in marking and planning the traffics in work. · The collective protections in structure and masonry are minor that a traditional work. Neither gallows nor rails have been in use type sergeant, but a line of life where the workers have hooked his harnesses and equipments of work in vertically. The time between the placement of the wrought horizontal one and his front is of less than 24 hours. Practically masonry and structure execute at par minimizing the risks of falls. When it has been necessary the hollows and edges they have put up signs and protected suitably. · The movements and tours of the panels of counter laminated wood have been done using a truck derrick. The carpenters estructuristas have worked from platforms of scaffoldings with rails and there have used small machinery of work as drills, circular saw of court, hammers and clavadoras. · The individual used protections have been hulls, boots of top of steel, protective glasses, belts portaherramientas, gloves of leather, safety belts and harnesses. · Due to the narrow and narrow of the plot there has been enabled a sanitary cabin prefabricated with wash basin and watercloset and for the dining room space was enabled in work by table and seats for the workers. · The maximum number of workers in the phase of masonry and structure has been of 4. 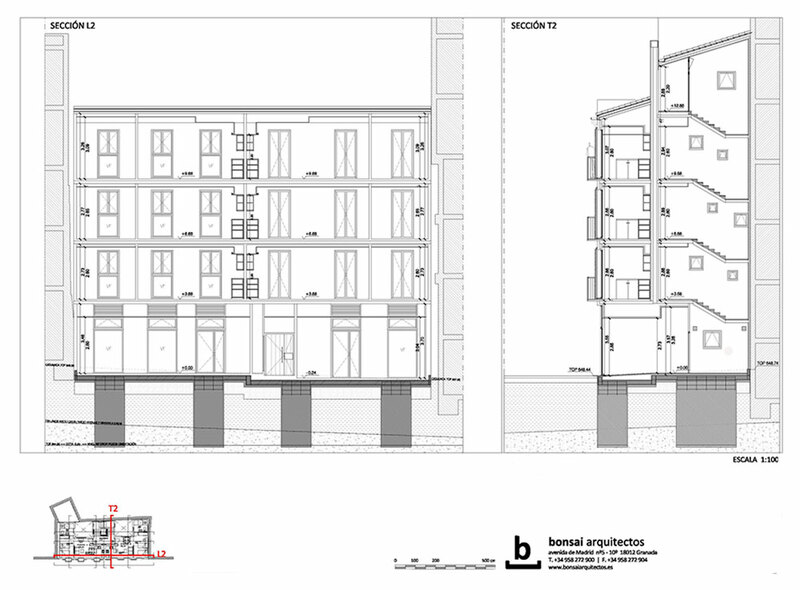 · The structure and the exterior masonry of fronts execute and end simultaneously for what diminishes considerably the risk of falls of materials and persons to different level. 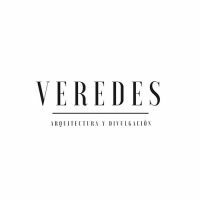 · The number of workers is low that in the traditional works for the slits of structure and masonry, with what the interferences and simultaneous actions are very small. · The water absence in work supposes an important saving in the general costs of the work. · The cleanliness and order in work is major that in the traditional works, with what there are minimized the risks of persons’ falls to the same level, and the falls for trodden on objects. · Risks of overstrains do not exist since the manual manipulation of the counter laminated panels is effected by the auxiliary means of elevation and transport. · The intensity of the noise is minor that in traditional works, producing a benefit to him on the workers and on his immediate environment. The work has been completed in the foreseen term, and inside the costs established in the study of initial viability. Awkward Una Constructora and a technical equipment overturned in a ferreous control of execution and economic follow-up have made possible the ‘squaring of the circle’. Considering the factor of initial uncertainty for the use of a new structure, the results are highly satisfactory. From the humility of this project we have defended a way of constructing more respectful both with the environment and with the immediate environment: rapid, clean, dry and silent work, mostly recyclable or reusable; water saving of 90 % with regard to an equivalent building constructed with reinforced concrete; use of the wood like guarantor of sustainability. 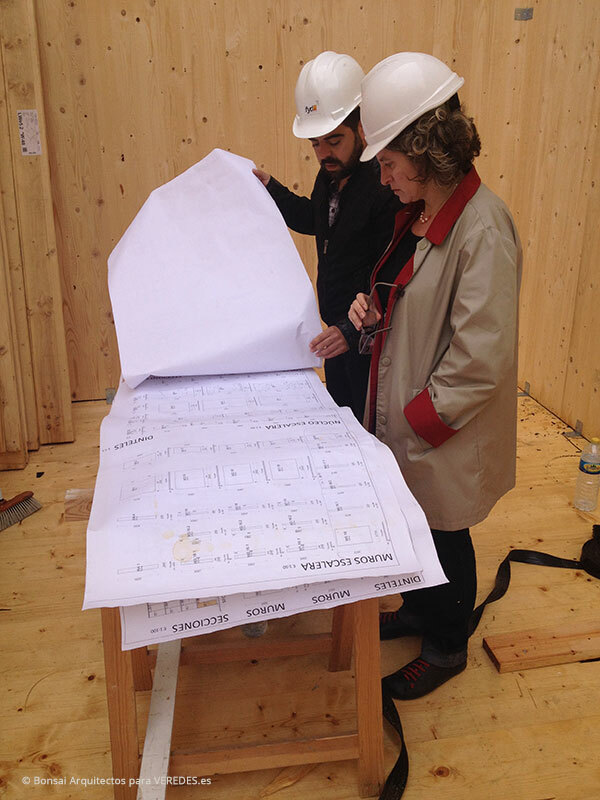 Only CLT’s structure supposes a reduction of the CO2 emissions to environment in approximately 270 tons. The energetic saving is up to 400 major % with regard to structural solutions of concrete or steel. In addition, the wood is free of organic volatile compounds and formaldeídos, and comes from sustainable developments with stamp PEFC. 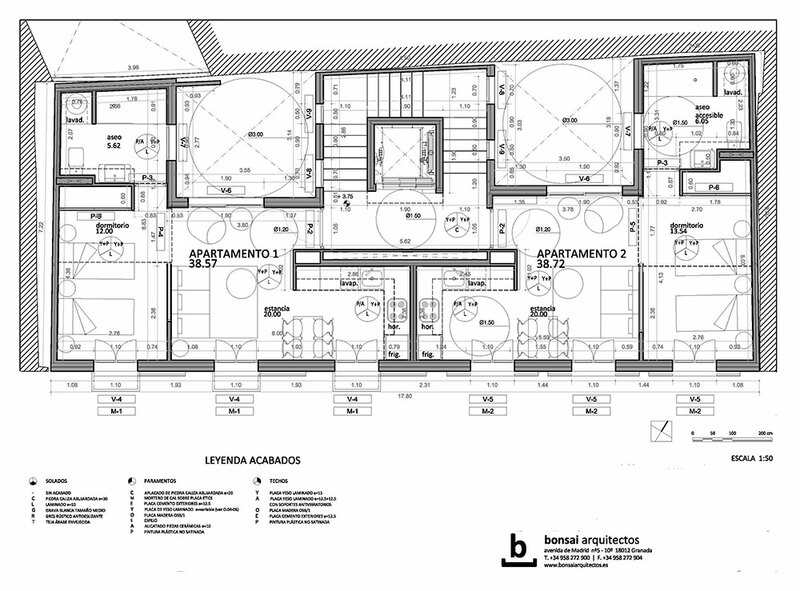 It is a question of a system that is in use for many years with great success in Europe for public and private buildings, and nevertheless our case treats itself about the first building of this nature in Andalusia. If we bear in mind that 30 % of the global emission of CO2 and 40 % of the global consumption of resources in Europe owe to the activity of the sector of the construction, we can do to us an idea of the importance that the new paradigm of the sustainability has for our future. The times evolve, and we must not continue constructing buildings as in the 19th century. There is necessary the commitment of the industry of the construction to find new competitive formulae, which solve the needs of the current company to economic costs – and environmental – permissibles.